Milan 2016: online furniture brand Hem is launching six new and updated products by designers including Philippe Malouin, Form Us With Love and Max Lamb in Milan next week. Hem, which was sold to a private investment company earlier this year, will present the designs at gallery Accapiù (H+), Via Varese 12, during Milan design week from 12 to 15 April 2016. Many of the items are designed to be flat-packed and easily shipped. Among the new pieces is the Bookmatch Table by London designer Malouin. His first product for the brand is made from intersecting planks of wood. "Composed of perfectly mirrored veneer boards, the Bookmatch Table pays tribute to the imperfections of nature," said Hem. "The simple construction makes assembly easy while maintaining lightness." German designer Karoline Fesser has created two new items. The drum-shaped Hide Side Table has a rotating shell that can reveal or conceal the contents stored on its two inner shelves. Fesser's All Wood Stool is based on workshop seats, and is adjusted in height using a screw-like stand. Stockholm-based Form Us With Love has created a three-dimensionally woven wool-blend fabric called Dash to upholster the Koti Sofa, which the studio designed for Hem last year. The Zig Zag Shelf by London designers Studio deFORM is made from solid oak. Its horizontal surfaces fit neatly between the frame so it requires no screws to assemble. Also, Lamb has created splattered versions of his Last Stool, which was originally designed for Italian company Discipline but is now produced by Hem after it acquired the rights to over 200 products. The colour variations of the stools have been used to inform four specially created ice cream flavours. These will be served during a series of talks named Ice Cream Socials, which will take place in the brand's Milan presentation space each evening from 4pm to 6pm. 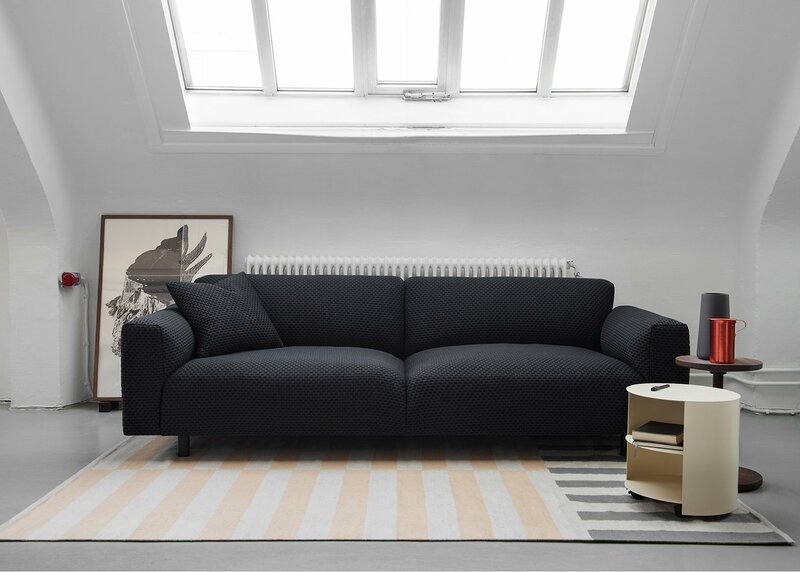 Hem was formed in 2014 when online retailer Fab acquired Scandinavian design brand One Nordic. As part of a deal in February 2016, designer and co-founder Petrus Palmér became CEO in place of Jason Goldberg, who left the now Stockholm-based company. Palmér also previously co-founded Form Us With Love.